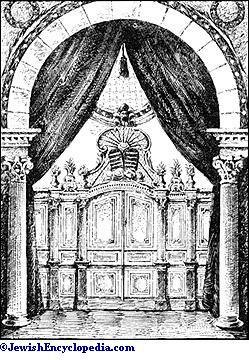 Ark of the Law in the Bayonne Synagogue. Fortified city in the department of Basses-Pyrénées, in the extreme southwest of France. It is divided into Great and Little Bayonne and into the suburbs of St. Esprit, which latter is separated from Bayonne by the rivers Adour and Nive. A Jewish community existed first at St. Esprit. It was founded, after the expulsion of the Jews from the Iberian peninsula, by detached groups of fugitives from Navarre and Portugal, where in order to save their lives they had had to submit to baptism. For this reason on their arrival they were styled "New Christians" or as being of the "Portuguese nation." Outwardly, they conformed strictly to all the practises of the Catholic religion, but in their homes they remained true to the faith of their fathers. No document exists that definitely determines the time of their arrival in the region about Bayonne. A certain number of them are known to have been, at about 1520, in St. Esprit, St. Jean de Luz, and Biarritz. Several families that had just settled in Bordeaux were expelled from that city in 1597 at the instigation of their coreligionists, and established themselves at St. Esprit, Peyrehorade, Bidache, and La Bastide Clairence, where they remained, although occasionally disturbed by a decree of expulsion like that of Henry IV., which, however, was not executed. Their status was regulated by a series of letters patent from Henry II. (1550, 1574, 1580), which were confirmed by later letters patent from Louis XIV. in 1654, from Louis XV. in 1723, and from Louis XVI. in 1777. At the beginning of the seventeenth century they relaxed in their observance of the Christian religion; and in the middle of the century they discontinued its practise entirely, openly avowing their own faith. After this they were called Portuguese Jews. Up to the French Revolution they were almost incessantly engaged in quarrels with the city of Bayonne and in suits against it on account of its refusal to grant them the right of sojourn and the permission to carry on retail trade. The National Assembly in 1789 accorded them, as well as the Jews of Bordeaux and Avignon, the rights of citizenship. After this they were incorporated into the body of citizens professing other faiths than the Catholic, and were thus enabled to settle in Bayonne and acquire property there; but the majority continued to reside, and still reside, at St. Esprit. During the Revolution, when their synagogues were closed, the Jews of Bidache and La Bastide Clairence left those places to establish themselves at Peyrehorade and St. Esprit. In the Assembly of Notables convened by Napoleon I. the Jews of the department of Landes were represented by Castro, the younger Patto, and Andrade, rabbi of St. Esprit; the Jews of the Basses-Pyrénées, by theyounger Furtado and Marqfoy of Bayonne. In the Great Sanhedrin they were represented by Marqfoy and Andrade. On the organization of the French consistories the community of St. Esprit-Bayonne was attached to that of Bordeaux. 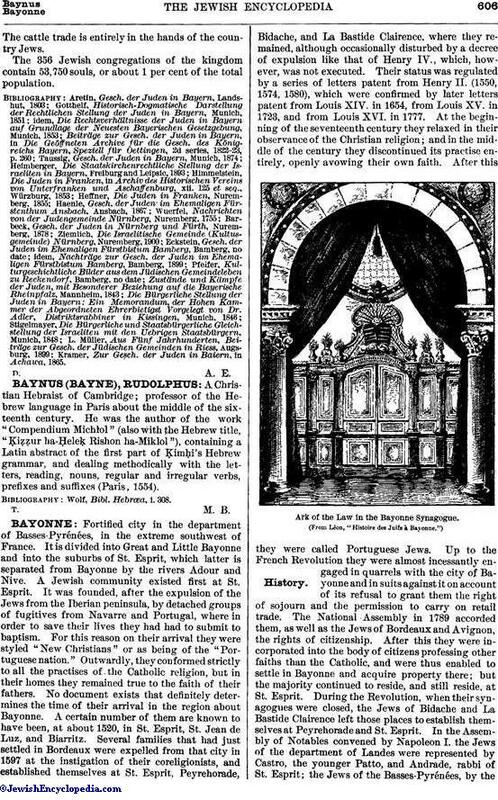 When the Jews of Bayonne could devote themselves to the untrammeled observance of their religion, they established rules for the guidance of the community. The first statutes go back to 1752. Up to the Restoration the two principal institutions were: La Hébéra, for charity and the general administration of the synagogue; and the Talmud Torah, for the elementary and religious instruction of the young. New regulations concerning various institutions were made in 1826. 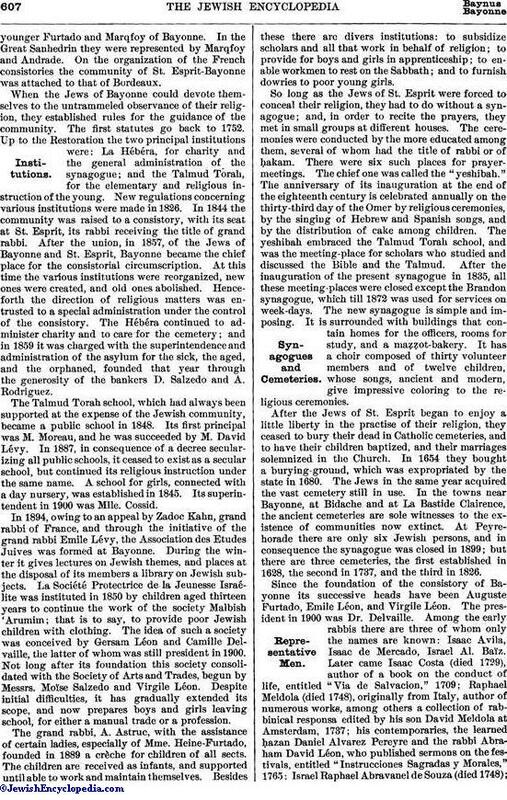 In 1844 the community was raised to a consistory, with its seat at St. Esprit, its rabbi receiving the title of grand rabbi. After the union, in 1857, of the Jews of Bayonne and St. Esprit, Bayonne became the chief place for the consistorial circumscription. At this time the various institutions were reorganized, new ones were created, and old ones abolished. Henceforth the direction of religious matters was entrusted to a special administration under the control of the consistory. The Hébéra continued to administer charity and to care for the cemetery; and in 1859 it was charged with the superintendence and administration of the asylum for the sick, the aged, and the orphaned, founded that year through the generosity of the bankers D. Salzedo and A. Rodriguez. The Talmud Torah school, which had always been supported at the expense of the Jewish community, became a public school in 1848. Its first principal was M. Moreau, and he was succeeded by M. David Lévy. In 1887, in consequence of a decree secularizing all public schools, it ceased to exist as a secular school, but continued its religious instruction under the same name. A school for girls, connected with a day nursery, was established in 1845. Its superintendent in 1900 was Mlle. Cossid. In 1894, owing to an appeal by Zadoc Kahn, grand rabbi of France, and through the initiative of the grand rabbi Emile Lévy, the Association des Etudes Juives was formed at Bayonne. During the winter it gives lectures on Jewish themes, and places at the disposal of its members a library on Jewish subjects. La Société Protectrice de la Jeunesse Israélite was instituted in 1850 by children aged thirteen years to continue the work of the society Malbish 'Arumim; that is to say, to provide poor Jewish children with clothing. The idea of such a society was conceived by Gersam Léon and Camille Delvaille, the latter of whom was still president in 1900. Not long after its foundation this society consolidated with the Society of Arts and Trades, begun by Messrs. Moïse Salzedo and Virgile Léon. Despite initial difficulties, it has gradually extended its scope, and now prepares boys and girls leaving school, for either a manual trade or a profession. The grand rabbi, A. Astruc, with the assistance of certain ladies, especially of Mme. Heine-Furtado, founded in 1889 a crèche for children of all sects. The children are received as infants, and supported until able to work and maintain themselves. Besides these there are divers institutions: to subsidize scholars and all that work in behalf of religion; to provide for boys and girls in apprenticeship; to enable workmen to rest on the Sabbath; and to furnish dowries to poor young girls. So long as the Jews of St. Esprit were forced to conceal their religion, they had to do without a synagogue; and, in order to recite the prayers, they met in small groups at different houses. The ceremonies were conducted by the more educated among them, several of whom had the title of rabbi or of ḥakam. There were six such places for prayermeetings. The chief one was called the "yeshibah." The anniversary of its inauguration at the end of the eighteenth century is celebrated annually on the thirty-third day of the Omer by religious ceremonies, by the singing of Hebrew and Spanish songs, and by the distribution of cake among children. The yeshibah embraced the Talmud Torah school, and was the meeting-place for scholars who studied and discussed the Bible and the Talmud. After the inauguration of the present synagogue in 1835, all these meeting-places were closed except the Brandon synagogue, which till 1872 was used for services on week-days. The new synagogue is simple and imposing. It is surrounded with buildings that contain homes for the officers, rooms for study, and a maẓẓot-bakery. It has a choir composed of thirty volunteer members and of twelve children, whose songs, ancient and modern, give impressive coloring to the religious ceremonies. After the Jews of St. Esprit began to enjoy a little liberty in the practise of their religion, they ceased to bury their dead in Catholic cemeteries, and to have their children baptized, and their marriages solemnized in the Church. In 1654 they bought a burying-ground, which was expropriated by the state in 1680. The Jews in the same year acquired the vast cemetery still in use. In the towns near Bayonne, at Bidache and at La Bastide Clairence, the ancient cemeteries are sole witnesses to the existence of communities now extinct. At Peyrehorade there are only six Jewish persons, and in consequence the synagogue was closed in 1899; but there are three cemeteries, the first established in 1628, the second in 1737, and the third in 1826. Since the foundation of the consistory of Bayonne its successive heads have been Auguste Furtado, Emile Léon, and Virgile Léon. The president in 1900 was Dr. Delvaille. Among the early rabbis there are three of whom only the names are known: Isaac Avila, Isaac de Mercado, Israel Al. Baïz. Later came Isaac Costa (died 1729), author of a book on the conduct of life, entitled "Via de Salvacion," 1709; Raphael Meldola (died 1748), originally from Italy, author of numerous works, among others a collection of rabbinical responsa edited by his son David Meldola at Amsterdam, 1737; his contemporaries, the learned ḥazan Daniel Alvarez Pereyre and the rabbi Abraham David Léon, who published sermons on the festivals, entitled "Instrucciones Sagradas y Morales," 1765; Israel Raphael Abravanel de Souza (died 1748);Jacob Athias (died 1791); Andrade, appointed grand rabbi of Bordeaux in 1808; David Hezekiah, son of Jacob Athias (died 1822); and his son, Jacob Israel Athias (died 1842). His successor was Samuel Marx, who, at the time of the creation of the consistory of Bayonne in 1846, was promoted to the dignity of the grand rabbinate. At his death in 1887, Elie Aristide Astruc, first a rabbi in Paris, then grand rabbi of Belgium, was elected. He accepted, but retired after four years, and was succeeded by Emile Lévy, rabbi of Verdun, who was installed in April, 1892. 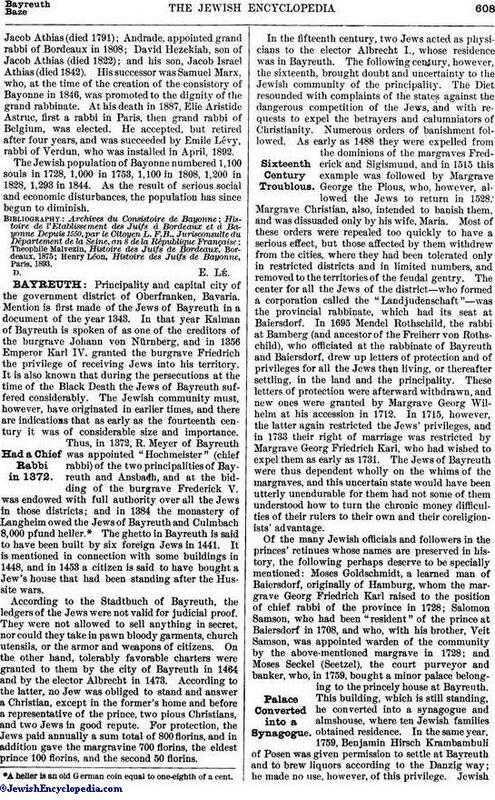 The Jewish population of Bayonne numbered 1,100 souls in 1728, 1,000 in 1753, 1,100 in 1808, 1,200 in 1828, 1,293 in 1844. As the result of serious social and economic disturbances, the population has since begun to diminish.